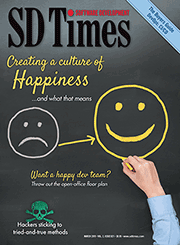 Each year the SD Times 100 recognizes companies, non-commercial organizations, open source projects and other initiatives for their innovation and leadership. It is not a product award. Judged by the editors of SD Times, the SD Times 100 recognizes the top innovators and leaders in multiple software development industry areas. Most companies, projects and individuals will be nominated for the SD Times 100 by D2 Emerge’s editors. Readers of SD Times are invited to submit nominations as well. Nominations for the 2018 SD Times 100 are now closed. The editors of SD Times identified the industry’s top leaders, innovators and influencers, and broke them out into 10 separate industry segments. Some companies lead in one category, others in more than one. In each category, one company has been spotlighted as a star deserving of special notice. When choosing the SD Times 100, we carefully considered each company’s offerings and reputation. We also listened for the “buzz”—how much attention and conversation we’ve heard around the company and its products and technologies—as a sign of leadership within the industry. The SD Times 100 looked for companies that have determined a direction that developers followed. Did the company set the industry agenda? Did its products and services advance the software development art? Were its competitors nervously tracking its moves? Were programmers anxiously awaiting its developments? Those qualities mark a leader. No special permission is required to use the SD Times 100 award logos by those businesses, organizations or individuals who have won the award. Other organizations who wish to use these logos must receive permission from BZ Media in order to do so. Contact David Rubinstein, drubinstein@bzmedia.com, to request permission and to inquire about reprints of the award article.